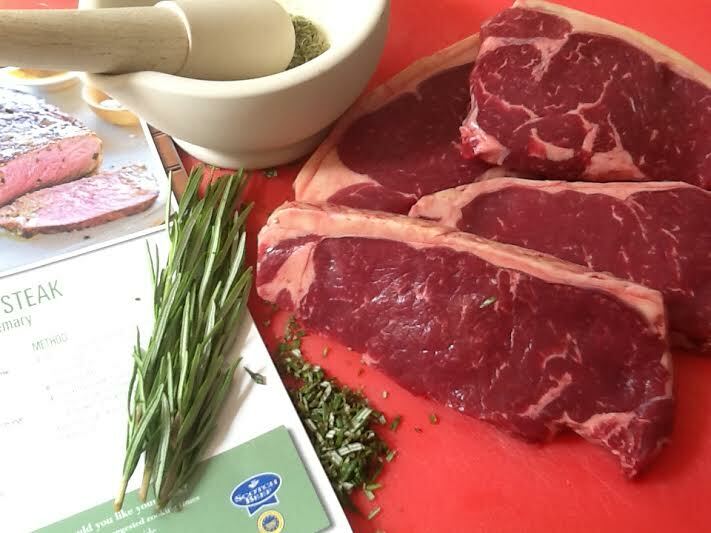 Scotch beef is renowned for it’s quality the world over and here at home we’re fortunate to have such fantastic farmers producing top quality beef, lamb and pork. Provenance is everything, with consumers demanding to know more about how and where the meat on their plate is produced. Key in all of this is knowing your butcher and he’ll be more than happy to discuss where his meat is farmed. But, there’s also another increasingly popular way to source good quality Scotch beef. What about knowing your farmer. With the increase and popularity of line shopping, there are now some exceptionally good Scottish farmers selling their meat direct to the customer. Damn Delicious , a family owned farm in Biggar, Lananrkshire has been selling direct since 2007 and recently, they sent me some of their outstanding Aberdeen Angus Scotch beef and pork. Damn Delicious take great pride in using unique and natural farming methods to ensure their meat is of the finest quality. All year round, the Aberdeen Angus beef herd live and roam outside on the farm. Grazing on fresh grass and clover in Summer, then when Winter arrives they feed on fresh kale with silage or hay. Farmer Michael Shannon believes that it’s this, along with maturing the beef on the bone for one month, that creates the most incredible flavoured meat, and ensures maximum taste and tenderness. Beef is something I really enjoy cooking and I have to say that over the years there’s been a number of occasions that I’ve been disappointed with meat that lacked flavour and tenderness. Happily the comments from the carniverous Gillon family’s taste test of Damn Delicious meat were fantastic and it’s a butcher I’ll be more than happy to buy from in the future. I stuck with a couple of family favourites for the casserole steak and the mince but decided to cook the steak using a recipe from a Quality Meat Scotland recipe booklet that arrived along with the meat. When cooked, the beef was incredibly tender and the flavour was outstanding, much stronger and flavoursome than other beef I’ve used. Here’s the recipes for the dishes I cooked. All serve 4. Scotch Beef Steak with fennel and rosemary. Ingredients: 4 Scotch beef steaks (sirloin, rib-eye, rump or fillet) I used 2 rib-eye and 2 sirloin. 2 tbsp olive oil, salt, freshly ground pepper, 2 tsp crushed fennel seeds, 2 tsp chopped fresh rosemary. These rib eye and sirloin steak lived up to the name, Damn Delicious. Method: Rub the steaks with pepper, fennel, rosemary and olive oil and leave to marinate overnight if possible, but 15 minutes will do. When ready to cook, the steaks can either be cooked on the BBQ or grill/griddle. Cook to your liking, (see suggestions) allow to rest and cut into thick slices to serve. Suggested timings from the QMS recipe booklet are :- Rare 2 1/2 minutes each side, Medium 4 minutes each side, Well done 6 minutes each side. 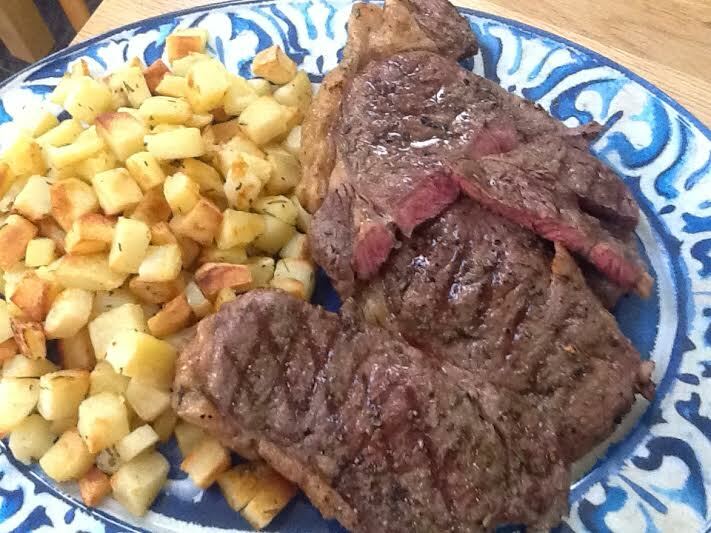 These timings are approximate and based on a 1″ thick sirloin steak pan fried. 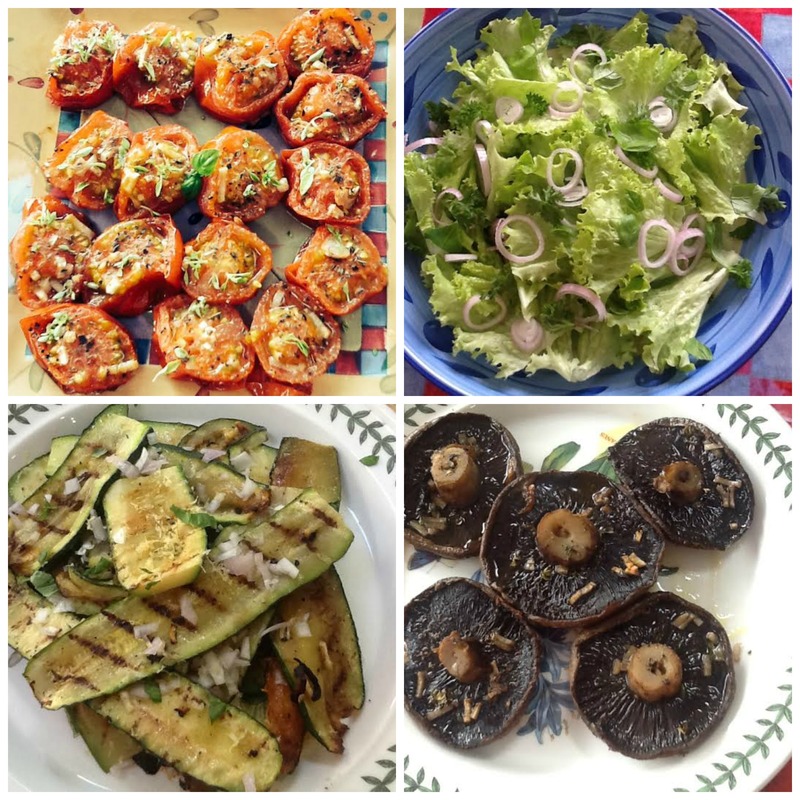 I served with roasted tomatoes, griddled courgettes, oven bake garlic mushrooms and a green salad. Italian Beef Casserole. Ingredients . 1 -2 tbsp olive or rapeseed oil, 450g diced casserole steak, 1 small pack of pancetta cubes, 1 onion finely chopped, 2 cloves garlic crushed, 2tbsp tomato puree, 400g can chopped tomatoes, approximately 250ml red wine, 2 tbsp mixed chopped fresh herbs, rosemary, and thyme work well. 1 bay leaf, half tsp dried basil, ‘a wee pinch of sugar’, salt and freshly ground black pepper, I red pepper chopped,1 chopped courgette (optional) . To finish: Rind of half a lemon grated, 2 garlic cloves crushed, 1 red chilli chopped and 3 anchovies. Finely chop to a paste like consistency. Method: Pre heat the oven to 150C/Fan 130C, Gas 2. Use a flameproof casseole, heat the oil over a medium heat, add the beef and brown on all sides. Don’t overcrowd the pan otherwise the meat will steam. As the meat browns, remove and set aside. Add the pancetta, brown for 1-2 minutes, add the onion and continue cooking for 3-4 minutes and then add the garlic. Cook for about 1 minute, return the beef to the pan and mix well. Add the tomato puree, stirring to coat the meat and cook for a further minute. Add the chopped tomatoes, red wine, herbs and a ‘ wee pinch of sugar‘. Slowly bring to a simmer, season with salt and pepper, put the lid on and transfer to the oven. Cook for 2 1/2 hours. 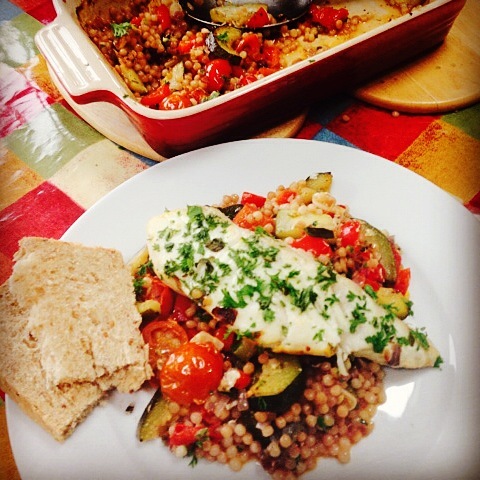 Remove from the oven and add the chopped red pepper and courgette if using and continue cooking for 30 minutes. Stir the anchovy mix through and mix well. Serve on a bed of tagliatelle and sprinkle with freshly grated Parmesan cheese. Serve on a bed of tagliatelle and sprinkle with freshly grated Parmesan cheese. 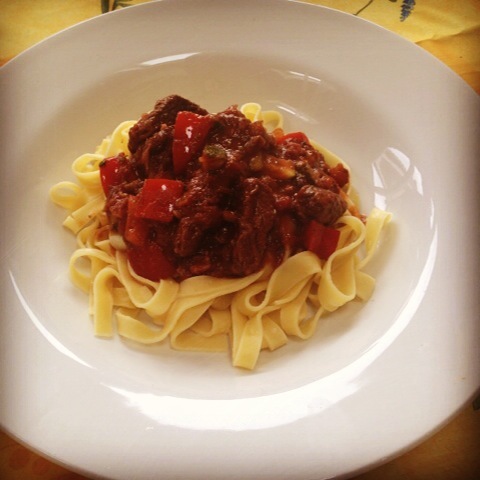 The final recipe with steak mince is one of my favourites, Spaghetti Bolognese. I’ve been making this dish for more than 30 years and over that time, the recipe has undergone many changes. Suggestions from an Italian relative and friends has meant new ingredients were added, or some were taken out, but after all those years the recipe is now in ‘tablets of stone’. 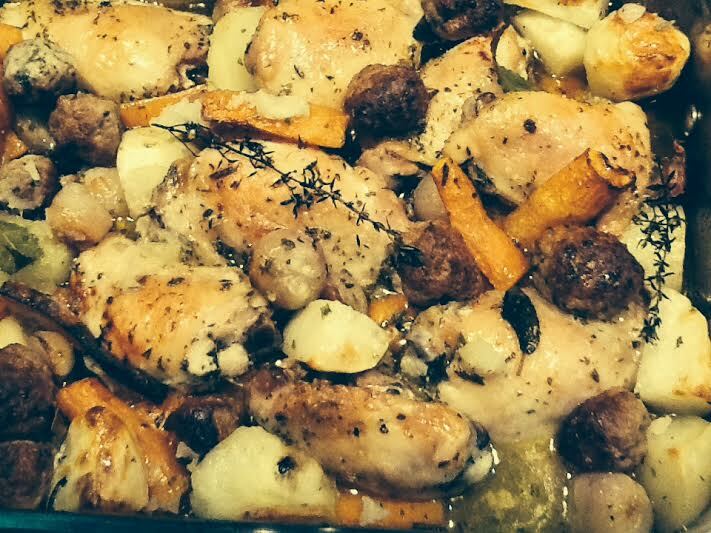 Washed down with a nice glass of red wine, it’s just the perfect comfort food dinner at any time of the year. 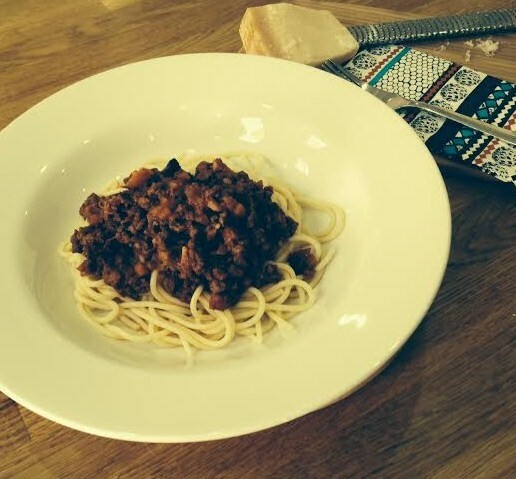 Spaghetti Bolognese: Ingredients: 1 tbsp olive or rapeseed oil, 1 onion chopped, 2-3 garlic cloves crushed, 1 small packet of pancetta cubes, 450g Aberdeen Angus steak mince, 1 tbsp plain flour (optional) large heaped tbsp tomato puree, 400 can of chopped tomatoes, 1 large carrot finely diced, 1 celery finely chopped, 1 tsp dried Italian herbs, approx 250ml red wine, a ‘wee pinch of sugar’, salt and freshly ground black pepper. To Serve: 400g spaghetti and freshly ground Parmesan cheese. Method: Heat the oil in a pan over a medium heat. Add the onion and cook for 5 minutes until soft. Add the garlic and cook for a further minute. Add the pancetta, cook for 2-3 minutes. 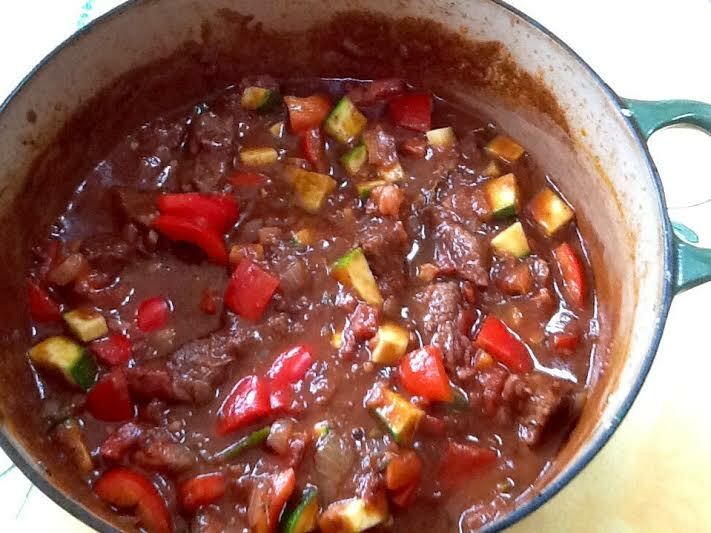 Increase the heat, add the steak mince and continue cooking until well browned. Reduce the heat, sprinkle the flour ( if using ) over the meat and stir for 1-2 minutes. Add the tomato puree,through the meat and continue cooking for 1 minute. Add the tinned tomatoes, carrot, celery, herbs, red wine, sugar, seasoning , stir and bring gently to the boil. Simmer for at least 1 hour, adding more wine or if preferred water, until the mince is tender. Serve with spaghetti and freshly grated Parmesan cheese. Next week I’ll be posting the recipe for the Damn Delicious Pork chops. Meantime, if you are interested in finding out more about Damn Delicious meat and their farming methods check out their website. Their new farm shop opens this week and will also be well stocked with top quality Scotch beef, lamb and pork. Damn Delicious are rightly proud of their unique farming methods. Further recipes for quality Scotch beef, pork and lamb can be found at QMS . When Kirsty Morrison, founder of Zing Organics sent me a range of her gourmet ‘aromachefery’ nectars and seasonings, it was a real pleasure to experiment and cook with them. Kirsty a Scottish artisan perfumer and Chandler, developed a natural range of aromatherapy based products after she became sensitive to a number of products and ingredients when pregnant. Our stories are similar. Kirsty learned about natural aromas and flavour from her grandfather who was a market gardener and at a young age was making perfume from petals. My introduction to fragrance was much the same, as a child I would collect rosé petals and add to small bottles of water to make my own rosewater. Fast forward a number of years and my interest in aromatics continued and to further my knowledge, while my boys were young, I trained in aromatherapy. That gave me a much deeper understanding of the therapeutic benefits of aromatic and medicinal plants, and I’ve been fascinated by them ever since. They became a big part of our lives and with their wide range of health giving benefits, aromatics, herbs and spices are an integral part of my cooking. 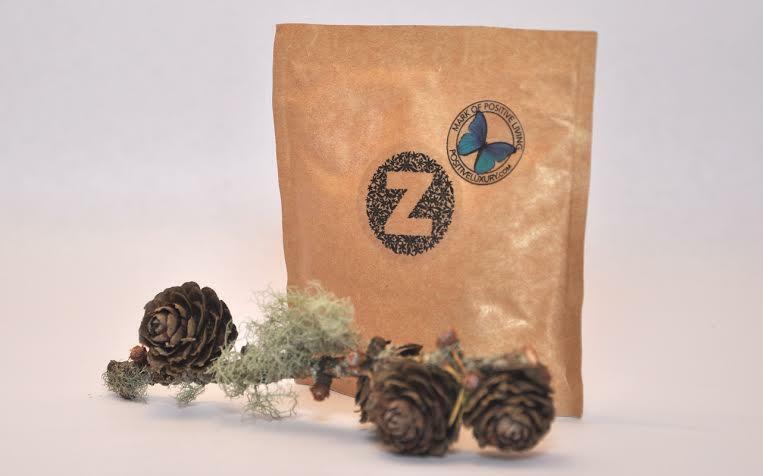 As you would expect from this high quality artisan range, Zing Organics aromatic salts and sugars, contain only natural ingredients which Kirsty infuses with food grade organic essential oils. She has created a superb product that’s simply bursting with natural flavour along with the most delicious heavenly aromas. The gourmet salt is available in a range of delicious flavours, including lemon, thyme, wild spruce, basil, Spanish thyme and Rosemary. Just sublime for enhancing a wide range of meat, fish, chicken and vegetable dishes. 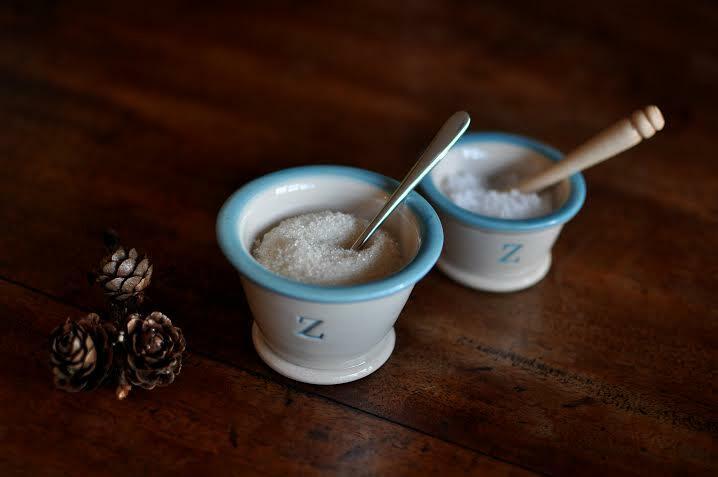 The sugars are all Fair Trade and like the salts are packed with intensely concentrated flavour. Lavender, cardamom, bourbon geranium, bergamot and ylang ylang, flavours that add another dimension to cakes, biscuits deserts, ice creams and drinks. Kirsty sent me the Thyme, lemon and black pepper sea salts to try and here’s some of the dishes they were added to. The lemon sea is so versatile, it’s uplifting and fresh citrus flavour is a perfect addition to chicken and fish. 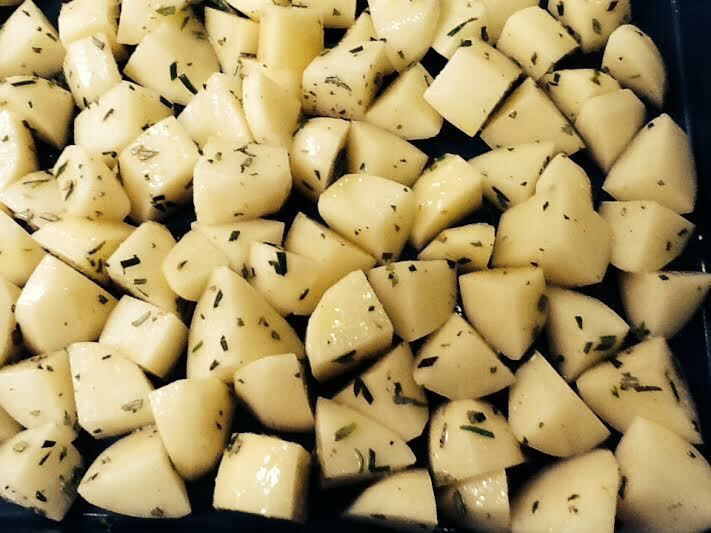 The spicy, herbaceous flavours of the Spanish thyme salt is wonderful with potatoes, chicken and meats. Black pepper sea salt, with its sharp, spicy and penetrating flavour is an ideal partner to mix with the lemon salt and will add deep flavour to most savoury dishes. A small sprinkling of both the lemon and thyme salts was ideal for this chicken and pork one pot dish. 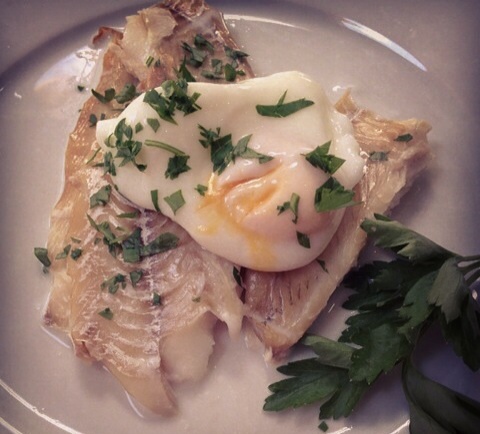 The lemon sea salt was also a wonderful addition to this smoked haddock and poached egg. A tiny sprinkle of lemon sea salt and a sprinkle of the black pepper salt really enhanced the flavour of this halibut, served with giant couscous and summer vegetables. And then, the promise of the ‘Hotter Moment‘, the pleasure you feel when you slip into a pair of Hotter shoes. Yes, that really does happen and it’s not the least bit embarrassing! Another passion at Hotter Shoes is to create beautiful shoes, footwear that’s fashionable, versatile and feminine with lots of detail. I was certainly impressed by the kaleidoscope of colours and prints across the collections, and with a wide range of styles, it meant there was a shoe for every occasion. Although I didn’t chose the prettiest pair of shoes in new colourful summer range, my choice, a pair of ‘Scarlett’ sandals, was perfect for my feet and my up an coming holiday to USA. 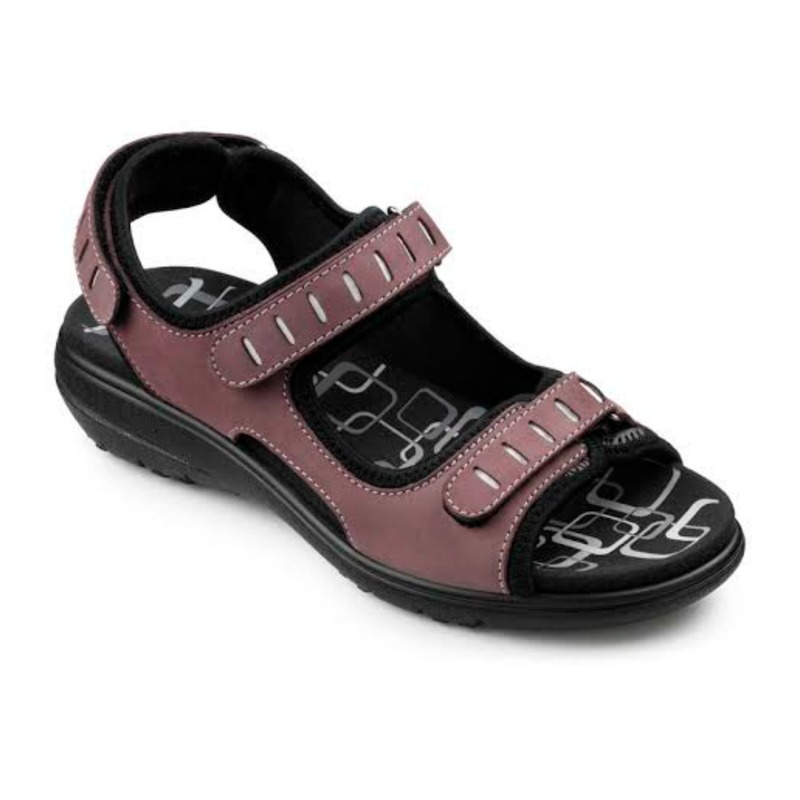 My ‘Scarlett’ sandals, described as anatomically designed to fit. I chose the Violet Nubuck but Scarlett also comes in ‘Dark Aqua, Khaki and Black and in two fittings, standard and extra wide. Fast forward a few weeks and me and my sandals were on a road test in Georgia and in particular the North Georgia Blue Ridge Mountains. 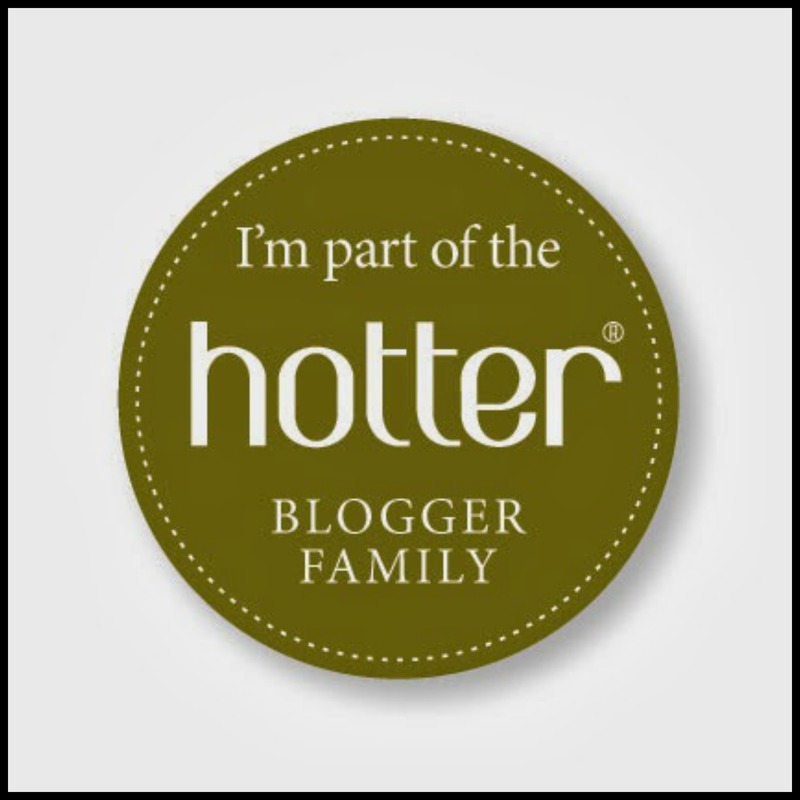 Did my ‘Hotter Moment‘ continue? Let’s face it, uncomfortable shoes can be a nightmare but on holidays there’s no time for aching feet. The answer is an overwhelming yes. These super comfortable, action woman sandals went fishing, dog walking, played ‘horseshoe’, lay on the deck, shopped and generally strolled around North Georgia. Back home in Scotland my ‘Scarletts’ have been a little less active but we’re still marching around the countryside on dogs walks and taking everyday life in our stride. Definitely at the top of my top comfy shoe list. The Summer has a bit to go yet and I’m sure my sandals will see some more action in the weeks to come. 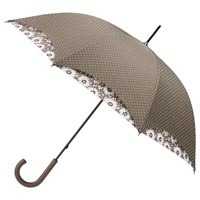 Hotter also gave me this beautiful luxurious Umbrella and I’m sure it will see plenty of action with the Scottish weather. Thanks to Hotter for providing the pair of Scarlett sandals for road testing. Check out the Hotter website to see the videos from the launch of the Summer collection at their Glasgow Store, with a few words from me on my Sandals. 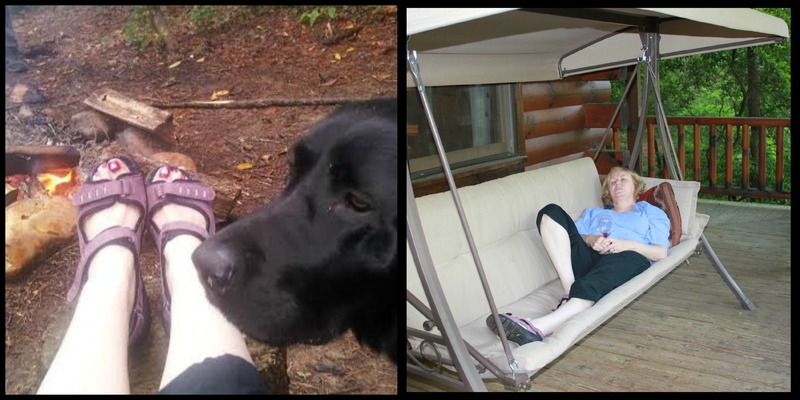 One last word…..thanks to Jess the dog for being my partner on the ‘Hotter’ road test. Being asked to review Edinburgh’s Stockbridge Restaurant was a real pleasure for me as Head Chef and proprietor Jason Gallagher is part of the Slow Food UK Chef Alliance, an organisation I wholeheartedly support. Jason is one of the 24 Scottish chefs in the alliance and has also been well recognised for his contribution in the hospitality industry with previous awards from the Scottish Chef Awards for City Chef of the Year, 2 AA Rosettes , Gold Award from the Edinburgh Restaurant Association and awards from Eat Scotland. All Chef Alliance members are encouraged to use seasonal and Forgotten Foods, whilst actively supporting the country’s small scale and good quality local producers. 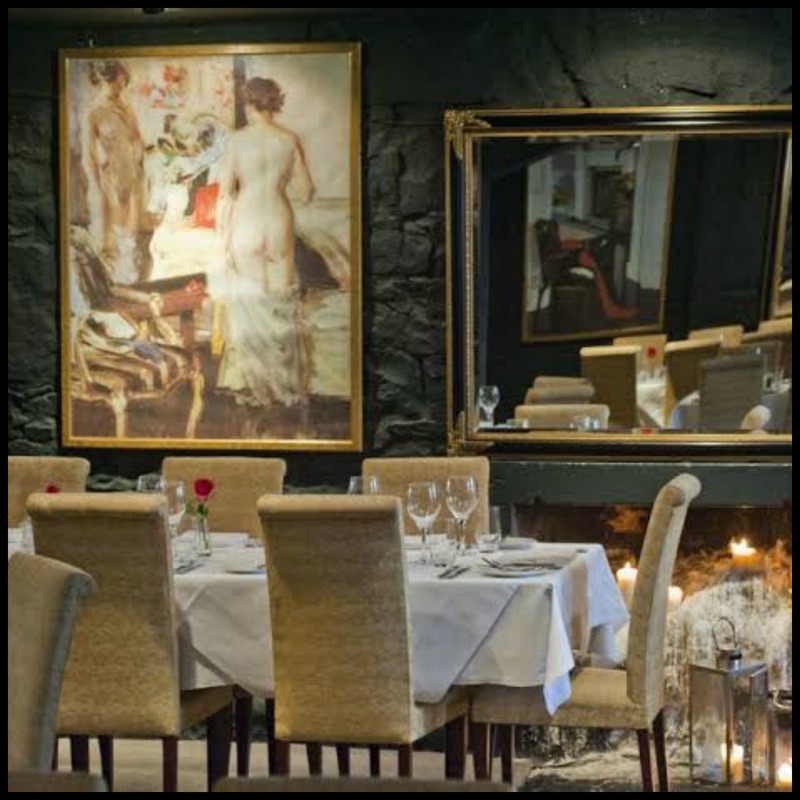 No problem with that at the Stockbridge, as both the a la carte and the set menus change regularly to reflect seasonality with clear references to the restaurants local suppliers on menus. The Stockbridge is almost secretly located in a basement in Stephens Street in the popular and quirky Stockbridge area of Edinburgh and offers classically cooked food with a modern twist. The richness from the painted black entrance and fairy lights is carried through into the restaurant, where the black walls, with large mirrors and colourful artwork give an uplifting but rich and sumptuous feel to the room. The black and gold decor with colourful artwork give the restaurant a rich lavish feel. The staff were extremely welcoming and were more than happy to discuss the menu and answer my questions about ingredients and sourcing. The warm homemade bread served with a tiny jug of olive oil, flavoured with chives chervil and mustard was wonderfully moreish, a simple and delicious touch. The small and tasty amuse bouche of Serrano ham, Mozzarella and tomatoes that followed was equally tasty, so far, an encouraging start to our meal. With both us being game lovers we both opted for for the spiced pigeon breast with duck liver pate. It was served with wild mushrooms, onions, pancetta and a red wine sauce. The pigeon was perfectly cooked, pink and moist well complemented by the earthy flavours of the other ingredients, making it a rich and flavoursome dish. Our like of rich flavours continued with our choice of mains and neither of us were disappointed. 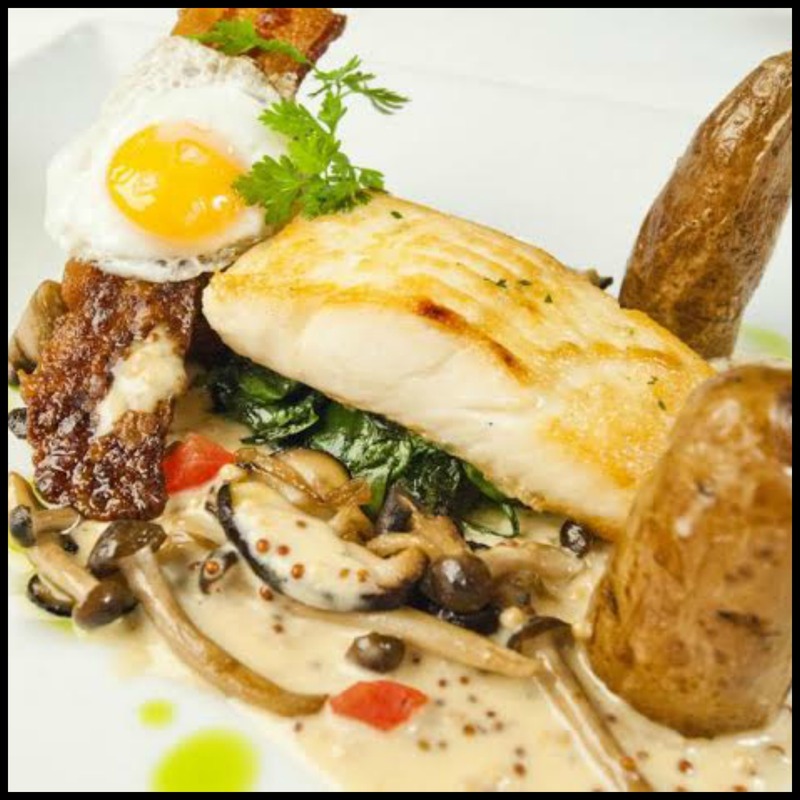 My generously portioned moist and perfectly flaking grilled halibut was not overpowered by the Arran mustard sauce or the accompanying grilled pancetta, spinach and wild mushrooms. It was served with sauteed heritage potatoes, arranged like tiny standing stones and finished with a perfectly cooked soft quails egg. Our other main of pork fillet wrapped in pancetta delivered equally on flavour. It was served with meltingly tender pork belly, cheeks, crispy ear, sweet potato and a delicious jus. Pork fillet can be quite uninteresting but this almost nose to tail dish had different levels of rich flavour and texture, with small nuggets of black pudding, making it an incredibly good meal. The choices for dessert were never going to be difficult for us with two of our favourites among the combinations on offer, rhubarb crumble and chocolate brulee. Firstly, the mood was set with a pre dessert of Jason’s own passion fruit sorbet. The perfect palate cleanser after our meal, it was tart, tangy and exceptionally refreshing. Of course, as you would expect our desserts were far more decadent and lush than just crumble and brulee. Rhubarb and nut crumble suggests a comfort pudding; one that would be perfect for my partner, but a more sophisticated hand had elevated the crumble to more of an elegant ‘pudding’. Served with a deliciously smooth and creamy vanilla sauce and praline ice cream, they were the ideal comfort partners. The chocolate brulee dessert was more of a chocolate heaven and not the death by chocolate I thought I might be treating myself to. 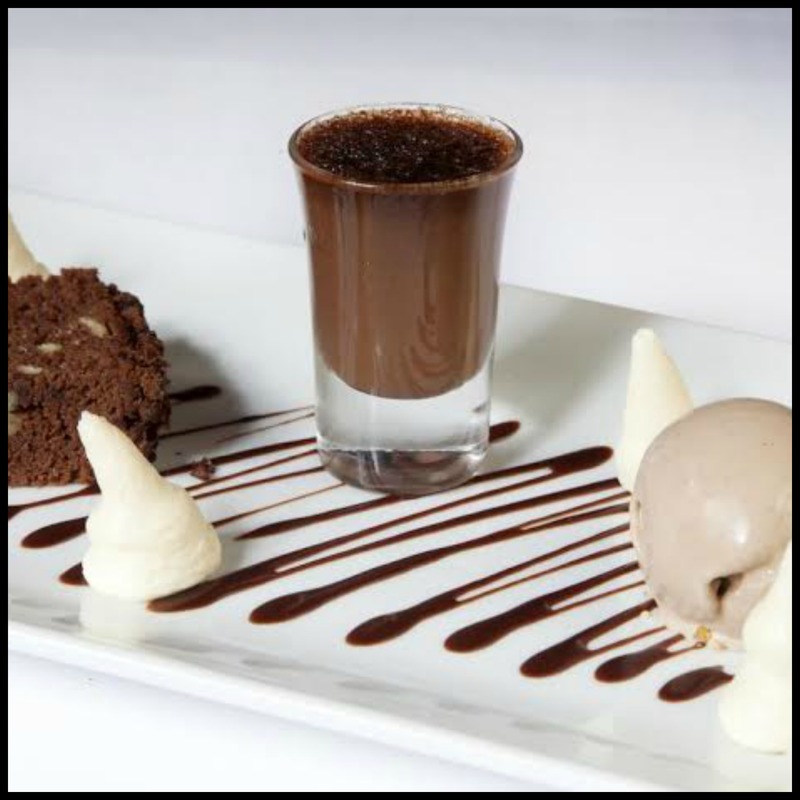 Served with a soft, moist and slightly gooey chocolate brownie, white chocolate mousse and milk chocolate ice cream it was light with sensational chocolaty flavours. Without a doubt our meal at the Stockbridge had all the ingredients for an exceptional meal. It ticked all the boxes, Jason’s affiliation to Slow Food’s Chef Alliance, the restaurants sourcing policy for seasonality and local ingredients and the star of the show, the food delivered what it promised, an informal take on fine dining. 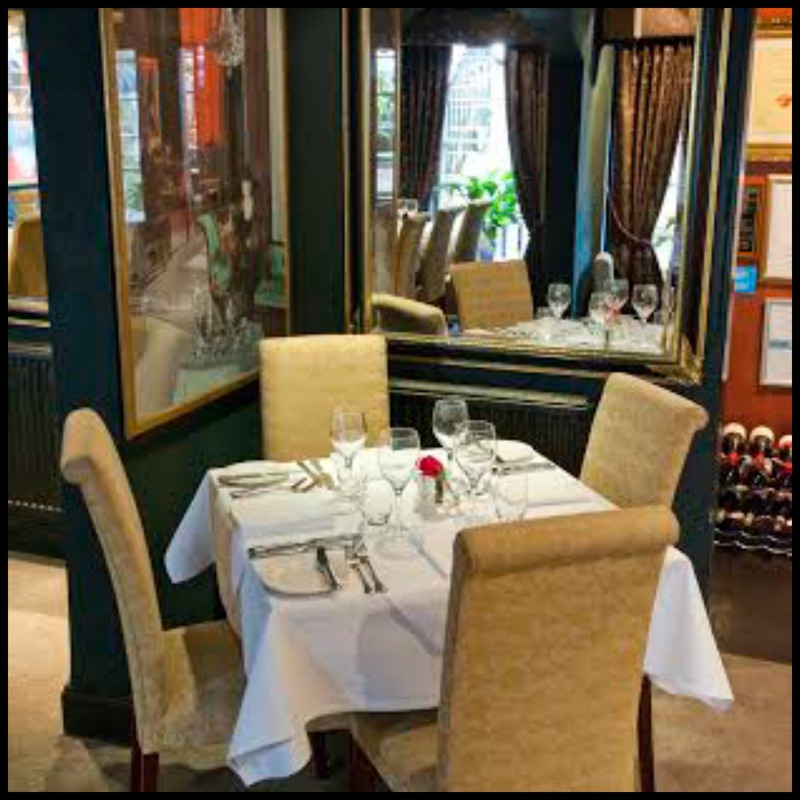 The Stockbridge offers the perfect ambiance for a relaxing meal. For a small restaurant, I was impressed that it hadn’t been overfilled with tables, still allowing for a more intimate dining experience. Both the a la Carte and the set menu offered a good balance of choices between meat, vegetarian and fish and diners can chose between both menus. The set menu offers excellent value at 3 courses for £24.95. 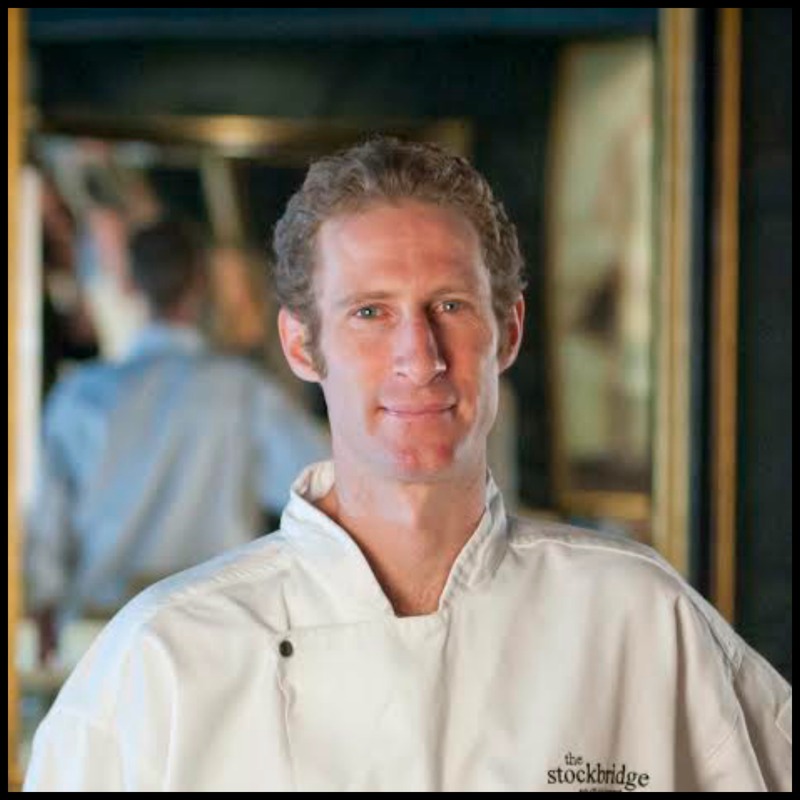 Photography credit – The Stockbridge Restaurant. Three Sisters Bake, Delectable Recipes for Everyday. My review of Three Sisters Bake, Published in May issue of Scottish Home and Country. It’s refreshing to see a new cookbook that’s Scottish and not written by celebrity chefs. The Three Sisters Bake: Delectable Recipes for Every Day, featuring beautiful bright food, is the icing on the cake for Renfrewshire sisters, Gillian, Nichola and Lindsay Reith. The book follows the success of their casual café dining and craft boutique, Three Sisters Bake, situated in the small and historic village of Quarriers, in Bridge of Weir. Gillian says their approach to food is simple: “Delighting the senses, cooking delicious things that look as good as they taste to enjoy with friends and family”. With a granny owning a sweet shop, their mum a home economics teacher, and the girls’ experience of cooking and tasting their way around the world, the sisters are now following their culinary dream. 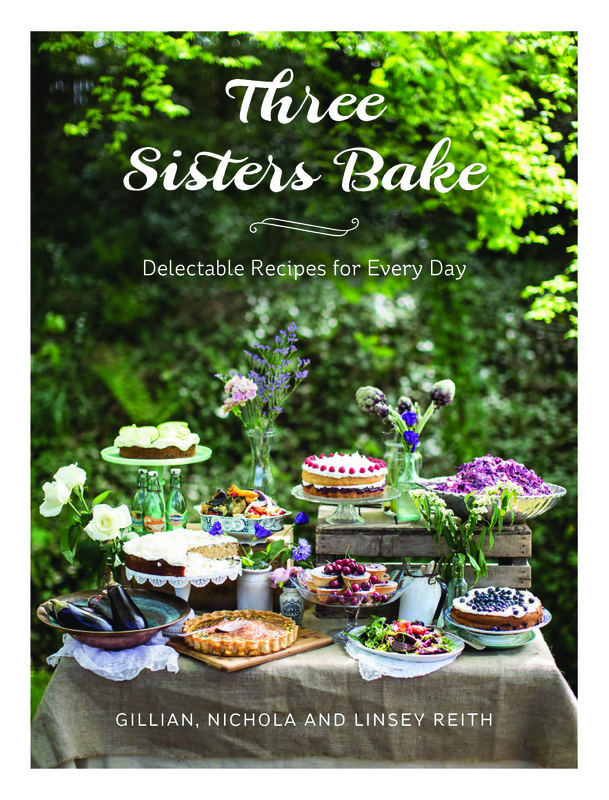 Three Sisters Bake: Delectable Recipes for Every Day is so much more than just another baking book, with its eclectic range of hearty classics, along with modern and quirky recipes. The youthful, energetic and fresh feel of the book, with warm, lively stories behind the food will appeal to all levels of home cooks. There’s the occasional wee Scottish twist, with recipes for lazy brunches, including the traditional Tattie Scone Stack, made with the famous Stornoway Black Pudding. Heartier classics for dinners include Chicken and Ham Hock Pie along with a Swanky Mac and Cheese. There are appealing sharing platters and lighter lunches of colourful soups and salads such as Barley and Blueberry Salad and Lentil and Apricot Soup. Stepping through the door of Jacques Table, a hidden restaurant in the Ayrshire countryside, you immediately sense the warmth. There’s a friendly welcome from Sylvia and a jolly ‘Bonjour’ from Jacques, the French chef in the adjacent kitchen. The hidden restaurant experience was not one I had enjoyed before and I was delighted to be invited to dinner at Jacques Table. 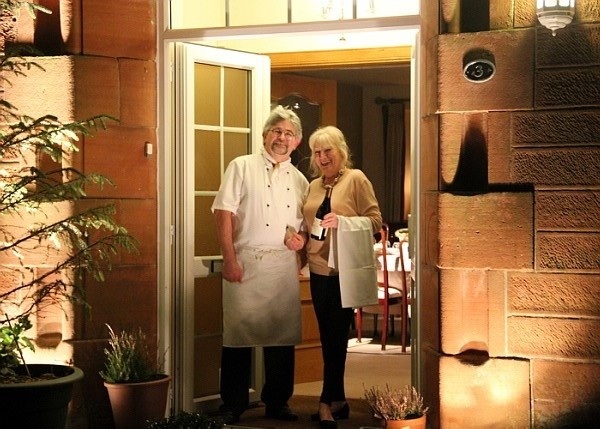 Jacques Troquet and Sylvia Brown have opened Ayrshire’s first hidden restaurant at their beautiful home in the former village school in Sinclairston. 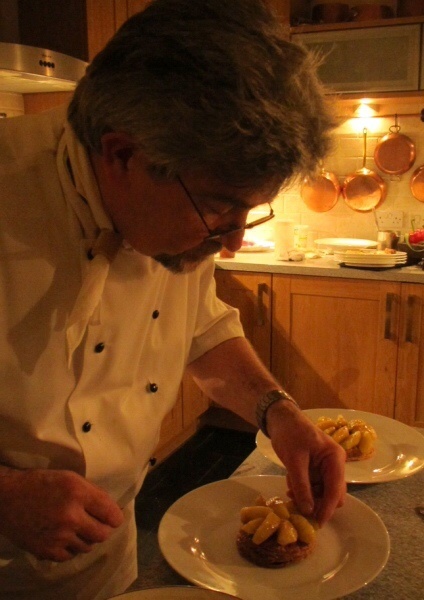 It may also be a first in Scotland to be run by a high profile classically trained French chef. Jacques has worked in many top class Paris hotels and was previously Executive Chef at the French Embassy in London. Now semi retired, the couple offer a unique, high end dining experience on two evenings and 2 Sunday afternoons a month. Jacques’ table seats ten and can be booked individually or for private parties. My partner in food for the evening was my friend Brenda Anderson from Tasting Scotland . We were joined by another four couples, for two, it was their second visit to the restaurant. And if the thought of dining with strangers worries you, within minutes of introductions, we found ourselves chatting with some very sociable people. The restaurant is in the former dining hall of the old school building and the richly set long dining table looked quite at home outside the subtly shaded kitchen. This room had history and I did stop to think about some of the school dinners that the previous occupants had enjoyed. Certainly not of the standard we were about to enjoy. 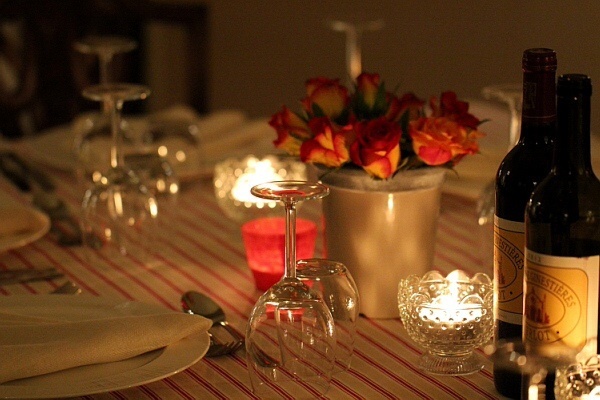 There is a classy but unfussy elegance about the room, plush carpets, neutral colours, flowers, a beautifully set table. It is their home, but there’s no feeling of being in their personal space. Dinner, like most hidden restaurants, was a set menu and the suggested donation is £35. Diners supply their own wine. We settled down on the comfortable sofas as Sylvia served complimentary aperitifs with a very generous selection of canapés. The lightest of pastry cases filled with aubergine caviar, tapenade on French bread and duck rillettes. There was also the most delicious talmouses, a blend of choux pastry filled with bechamel sauce and goats cheeses, wrapped in a light puff pastry. For me the pastry was a real winner, crisp short crust and buttery light puff . It quickly became the topic of conversation, discussions about how puff pastry could be so exceptionally good. With canapés of this standard, I had a feeling this was no ordinary supper club. The meal started with a subtly flavoured Mise en Bouche of celeriac soup with brown shrimp. Served in a tiny espresso cup, it was velvety smooth and creamy, the brown shrimp being a nice addition. The starter of cold terrine made with various prime fish in their own jelly with asparagus was cooked perfectly. There was just the right amount of jelly to hold the fish, bringing together some fantastic flavours and it worked perfectly with the asparagus. The main of stuffed quail with duck liver baked in a rich red wine jus was dark and earthy, this was French classical cooking at it’s best. The tiny quail was cleverly stuffed with moist duck liver and generously served with fondant potatoes, glazed carrots and mushrooms. It tasted sensational, a marvellously rich and satisfying dish. The Millefeuille dessert, like the canapés, showcased the chef’s expertise in pastry making. Slicing through the delicate layers of puff pastry, it flaked perfectly and was crisp and light, a real first class dessert. The creme patisserie added the perfect level of sweetness and tartness. The wine brought by the guests to enjoy with dinner was set out on the nearby sideboard and Sylvia ensured the wine glasses were kept topped up throughout. I had asked wine merchant Pieter Rosenthal to match wine for the menu and he had recommended a Demi sec Vouvray. Slightly sweet with a crisp appley acidity, it worked well, powerful enough to stand up to the rich gamey flavours of the quail and duck liver without swamping the lightness of the dessert. Clear plates and much praise from fellow diners was a sure signal that we had all enjoyed our meal and truly magnificent evening. It was rounded off with coffee and generous helpings of Jacques truffles and petit fours. 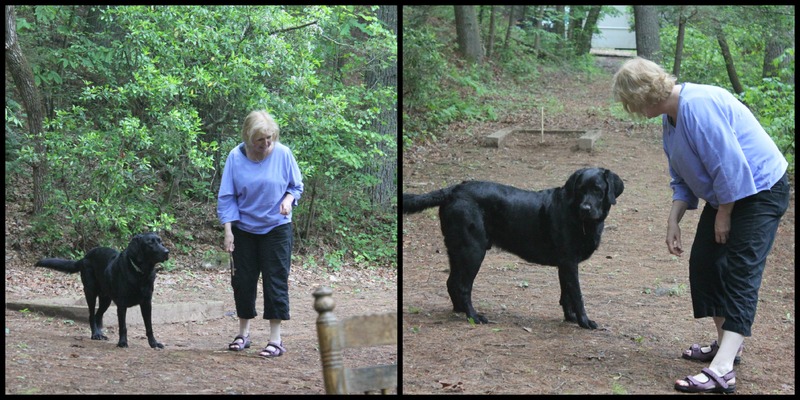 Jacques and Sylvia were the perfect hosts. I was reminded of some of my trips to friends in France. In true French style, we chatted, lingered over our food, we relaxed. It had gone midnight, we had been eating for almost 5 hours and now the chef had joined us. There was still much to discuss, like how did he make that pastry? There are some things in my fridge that are must have as far as my boys are concerned and that’s ketchup and brown sauce. No matter what other fancy ingredients, foods and sauces lurk on the shelves, the tomato ketchup and brown sauce are firm favourites with them. The sauces also find their way into several of my recipes and ketchup is also a secret ingredient favourited by many chefs with even the great Michel Roux using ‘Tommy Ketchup’ in his shepherds pie. However, we’re prone to a bit of sauce snobbery in our house. We’d never be seen dead with cheap ketchup, it’s always the well known brand, served straight from the the bottle. No fancy sauce dispenser for us, we like to show our label! But what about a change in brand, what kind of reaction would that get from the boys. Edinburgh based company, Maw Broon’s sauce had sent tomato and broon sauces for reviewing and of course the best time to test was with the big Sunday cooked breakfast. I’m more of brown sauce fan when it comes to sauce with my breakfast sausage while the boys are long time lovers of ketchup. Made in small batches from the very best ingredients. Both sauces got the thumbs up. The tomato sauce was rich and tomatoey, as you would want from a sauce to accompany food. The brown sauce ticked all boxes with it’s fruit and tangy flavour and was the ideal accompaniment to our Sunday breakfast. Also the sauces have no artificial additives or preservatives, good enough to be in my pantry and on the table, labels and all! Products that create shortcuts with cooking are fine by me, providing I’m using quality natural ingredients that don’t compromise the finished dish. I was more than happy to cook the dishes with spice mixes sent to me from Our House of spice . The mixes form part of the ‘spice packet range’ and contain no additives other than the addition of salt. Being a family of spicy food lovers, the two dishes were ideal accompaniments to our Saturday night curry. Third generation & Award winning bakers Reid’s of Caithness have been baking biscuits and cakes for over 100 years, thanks to family recipes handed down from their late Grandmother. Son, Donald Reid, began baking his mother’s recipes in 1966 and started the Reid’s bakery business by opening his first shop in Caithness. Two year later he was joined by his wife Joyce and today his son’s Gary and Graeme are now involved in running the company. Reid’s have been well recognised for the quality of their bakery products, with number of awards in recent years. Awards from the Guild of Fine Food ‘Great Taste Awards’ and Scottish awards from Highlands and Islands Food and Drink are testimony to the taste and quality of Granny Reid’s recipes. As well as being sold at their own shop in Caithness, you’ll find the Reid’s wide range of cakes and biscuits being sold the length and breadth of the country. The brand was also spotted by chef Jamie Oliver and now the company make a range of biscuits for the Jamie Oliver brand. Recently, I caught up with the third generation, Managing director, Gary Reid and was impressed by the wide range of cakes and sweet and savoury biscuits produced by Reid’s. There’s Crofters Cake, Viking cake and Banoffee cake in the loaf cake range. The Caithness and Tartan ranges have a wide selection to chose from including, Treacle Toffee biscuits, Shortbread, Stem Ginger Oaties, and Honey & Oat bites. The savoury range has oatcakes and Reid’s own unique ‘Groaties’, small mini oatcakes with a good selection of flavours to chose from and Reid’s very kindly sent me the Deli Packs with the mini oatcakes and groaties to sample. Oatcakes are always my savoury biscuit of choice. Mid afternoon, as an alternative to cake or sweet biscuits, I tend to snack on dry oatcakes and found Reid’s were ideal for that. The texture was good, not dry, but a nice crisp crumbly texture and natural tasting flavours. If I feel the need for a sweet treat then some lemon curd on an oatcake usually does the trick. My favourite was the Rosemary and Thyme, with a subtle herby flavour and delicious with a nice strong cheddar. I’d definitely recommend the Reid’s savoury range and they’ve earned their place on my future cheeseboards, snack list and also for including in my food gift baskets. 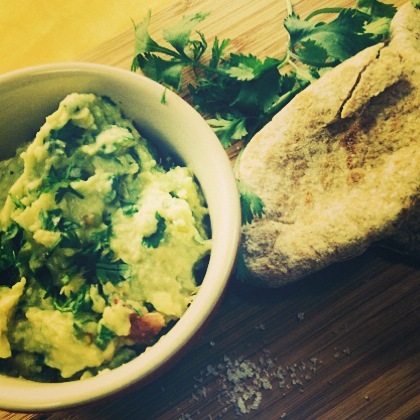 The ‘Groaties’ & mini oatcakes are ideal with cheese and other savoury food. The Pembrokeshire Beach Food Company. The finalists for the BBC Food Programme, Food and farming Awards were announced today and it was great to see The Pembrokeshire Beach Food Company amongst them. They were one of the food companies I caught up with during my visit to the BBC Good Food Show in Birmingham last November. The company was a real worthy winner of a BBC Good Food Show Bursary and it is fantastic to see them as a finalist in the Best Food Market category of the Food and Farming Awards. Their seaweed products are definitely in the deliciously different category. 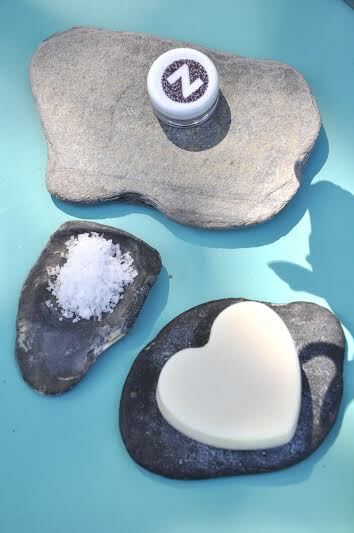 The company use foraged seashore ingredients found on the Pembrokeshire coastline to produce a range of seaweed based products, including Ship’s Biscuits, Lava Bread Pesto and seaweed flavoured butters. They also have 5 mobile beach huts and have cleverly combined foraged ingredients from the seashore to create a number of delicious signature local dishes, including, Salmon Laverbread and Cheddar Cheese, Bacon, Cockles and Laverbread and Sea Spaghetti Chocolate Chunk Cookies.